I had been holding off on posting about this until more information came out. As you can see there's a poster for the film, as well as a release date which is currently set for June 13th, but is always subject to change. Tommy Jamison is a very famous actor, the star of the mega-hit show "The Incredible Jack Rio", a film noir soap opera. However, after 4 years of playing 'Jack', he is almost never called by his real name anymore, and he is sick of it. The fans, the loss of identity, the pressure to be 'Jack', it's become too much for him. Tommy wants off the show that has made him famous. When a string of murders coincide with his scheduled appearances in public, the question is raised "Does Tommy have an obsessed stalker, killing in honor of Tommy?" Perhaps. Perhaps something far worse is at work. 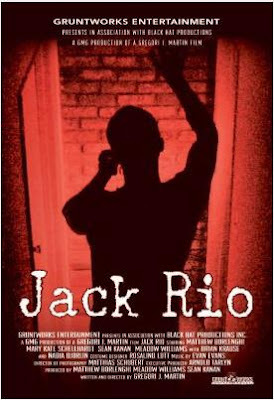 "Jack Rio" will thrill you. All I can tell you that Jelynn plays Kelly Morgan and will be sharing the screen with two of my favorite actors, Brian Krause and Jonathan LaPaglia.